Pilot of fatal NYC chopper crash tells investigators fuel supply was turned off in flight. 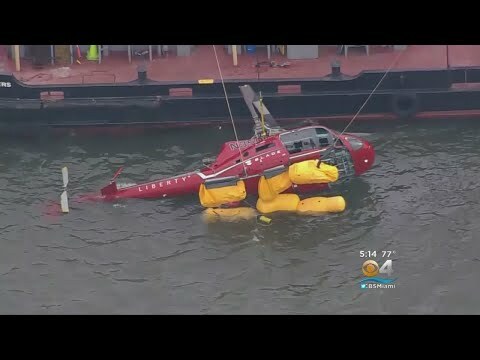 The pilot of the photo-tour helicopter that crash-landed in New York’s East River this month said a safety tether designed to keep passengers inside the open-door flight may have accidentally shut off the craft’s fuel, causing it to lose power. The pilot, the only one who escaped the helicopter as it rolled over in the frigid waters, told National Transportation Safety Board investigators that the tether used by a passenger in the front seat was wrapped around an emergency fuel shut-off switch, according to a preliminary report released Monday. The aircraft lost power and glided into the water. The March 11 accident killed all five passengers after they couldn’t get out of the helicopter. They were harnessed to the craft as it flew with doors open so that they could photograph the Manhattan skyline. Divers had to cut their bodies loose. The pilot said he gave the passengers a safety briefing and told them how to use a cutting tool attached to each harness so they could get out in an accident, according to the report. He also said that after the helicopter hit the water, he tried to release the tether connecting the front-seat passenger but was unable to do so before the craft began flooding. The NTSB’s report contains preliminary factual information but no conclusions about the cause of the accident. The Federal Aviation Administration has ordered a halt to commercial open-door helicopter flights that don’t provide passengers with quick-release harnesses and NTSB also issued an urgent recommendation calling for the same action. The helicopter was equipped with floats designed to prevent it from sinking after a water landing. After the accident, investigators found that the floats on the left side were more inflated than those on the right. A video of the forced landing shows the helicopter rolling into the water on the side that was less inflated. During the descent, he yelled at the passengers to return to their seats. Some passengers were allowed to take off their regular seat belts and move closer to the door opening while still tethered to the helicopter. After discovering the emergency fuel value had been closed, he switched it back on and tried to restart the engine. “He observed positive indications on the engine instruments immediately,” the report said. However, he abandoned the effort to restart the engine after concluding he wouldn’t get power in time to prevent a crash, he told investigators. This helicopter, like most helicopters had glide ration about like a brick. Bad deal, the floats not being properly inflated.